The Assembly at Spencer Bridge Road, Northampton, UK hosted the biennial visit of the Ayrshire Bible Exhibition again between the 14th and 25th March, 2011. This is the seventh time the event has been held here. As in previous years the outreach was focused on 10 - 12 year olds (Grades 5-6). In addition to the schools, invitations were also sent to other 'churches' in the town as well as other assemblies requesting prayer for the event. Schools had been notified of the exhibition dates as far back as November last year and again in January, 2011 to ask them to make firm bookings for their group visits. A big factor in their ability to attend is the fact that the Assembly provides free transportation. Without this, attendance would be very difficult. Schools have commented positively on the fact that people are willing to pay for children to come and learn about the Bible. There has been a waiting list of schools wanting to attend on the last 2 visits. Some 1200 children from 29 schools attended along with their teachers. They were divided into groups and shown around the exhibition by guides from the Assembly using a worksheet with twenty-one questions to be answered. During the tour there were six or seven occasions, through the questions, where a simple but clear gospel message could be given. e.g. 'Why did God send His Son'? or 'What are the two ways on the Wayside Pulpit poster'? 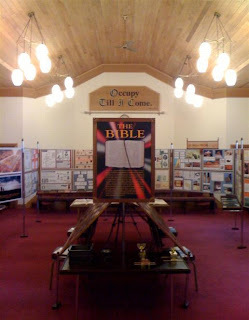 In the displays there were topics such as the origins of the Bible, its history, etc. where links could be made to school curriculum. The tour was followed by a 'fun' quiz to reinforce what they had been told in the tour. The children were given a 'goody bag' when they left containing various items such as a Gospel of John booklet, text bookmark, leaflet on the Dead Sea Scroll, a pencil and if appropriate - invitations to Sunday Schools/Children's meetings in the local Assemblies. Just think how many weeks it would take your Assembly to see 1200+ people through the doors to hear the Gospel, the majority having never heard anything of it before? Although the exhibition is open to the general public we do not see a great response. Those who do come in are impressed by what they see. The exhibition has been used as a means of accessing schools in the county through presenting prizes to children who have neat, all correct worksheets. We currently have access to forty nine schools that participate in the exhibition. Each school will be visited at least once in the term. The schools are already anticipating the return of the exhibition in 2013, Lord willing, but please pray for the seed sown and Graeme Paterson who 'runs' the exhibition. A great afternoon, so welcoming and engaging. The children learnt loads & thoroughly enjoyed it, thank you very much. A fantastic, well organised afternoon. The children were focussed, enthused and excited by the learning. Thank you. The children had a fantastic time. It’s amazing how much they took in, super staff and thank you very much. Wonderful! So organised, exciting and fun – thank you. Children found it fascinating and were fully engaged throughout. Many thanks. Thank you for a fantastic hour of information and great fun, from all children and adults. Amazing amount of information and the kids (and me) found it a great time. Very innovative quiz. Thank you, the children were fascinated and had so many more questions. Lots of information for the children to take in but all engrossed! Learnt far more than they do in an hour in school (as did the adults).